NO! We want to show the kids the DIFFERENCE between magic and science. Sure, magic is fun - and, in fact, we start the show with a magic trick - but with science there are no secrets! We as Mad Scientists get to tell everyone how everything works! We'll do lots of fun, visually interesting experiments, with plenty of opportunities for helpers (usually the birthday child)! Our inquiry-based presentation ensures that the show isn't a lecture. We want the kids to tell US what's going to happen. We pose problems and "what-ifs" and let THEM work out hypotheses that WE test out! Create a tiny lightning storm! Create tornadoes in a tube! Light a lightbulb without plugging it in! See how a rainbow is made! Melt ice - using cold! Create an electrical circuit with the audience's bodies! Kids love the opportunity to show off what they know or what they think will happen next. 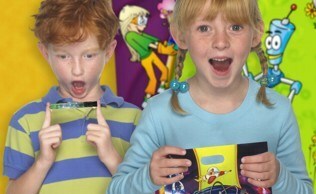 Unlike a magic show, we encourage kids to tell us what they think is going to happen! In addition to the constant audience interaction and the occasional helper during the show, all the kids will get to make something to take home. That may be Mad Science Slime, Mad Science Putty, or Mad Science Bouncy Balls! Kindergarteners through 6th-graders tend to get the most out of our Birthday Parties, but younger or older kids will certainly have a blast. Younger kids will love what they see and older kids will love learning WHY things happen. The Mad Scientist will always tailor the party to the age group - giving older kids a bit more explanation than with a younger group. What does my birthday child get (aside from the coolest party ever)? Before the show, the Birthday Child will receive a cool, full-color Mad Scientist T-shirt which will identify them as the Mad Scientist of the day! During the show, our Mad Scientists seem to call on Birthday Children for help a lot. Go figure! Plus, they'll have the very same take-home activity as everyone else! After the show, the Birthday Child gets one more surprise - a large, full-color Mad Science poster that each guest can autograph! Absolutely! While the kids may not themselves be aware that they are learning, the parents certainly are. Our Birthday Parties are based on the same teaching methods and materials used in our classroom programs, but with even more entertainment thrown in. Aside from the specific material covered, the kids will become very familiar with the concepts of observation, hypotheses, and experimentation. You better believe it! As much as we want kids to have fun, it's even more important to us that they be safe. Most of what we use are household items used in new and creative ways. Some experiments may use small flames but these are for the Mad Scientist only - which, of course, is made perfectly clear! Bubbling Potions - dry ice and movie effects! Voice Warp Generator - be a Munchkin or Darth Vader! Laser Light - fun with lasers, mirrors, and fog! Rocket Launch - launch 2 model rockets up to 500 ft.! Cotton Candy - learn how it's made then eat lots of it! Hovercraft - everyone gets to float on a cushion of air! Periscope Making - build your own working periscope! UV Bead Making - beads that change color in sunlight! Slime/Putty/Bouncy Ball Making - a second take-home activity in addition to the one already included in the standard party! What about goody bags and party favors and stuff, huh? Fully Stocked Goody Bags - Mad Science take-homes! Extra T-shirts - for your party guests! Experitube Containers - test tubes for small favors! Mad Badges - Mad Science name tags for everyone! Yes, however any changes to your party must be scheduled at least one week before your party. *Additional travel fee required in some areas. Please download our Birthday Party Options flyer or check out our Birthday Party Booking Form for detailed information on pricing and options. Feel free to call or e-mail us for additional information. No payment information is required at booking. Payment is not required until your show is over and you are completely satisfied. Remember, Mad Science is confident in the quality of its programming and we are 100% satisification guaranteed. Yes - we accept MasterCard, Visa, and Discover. No. All we need is an estimate of the number of children you expect to attend. We ask that you plan for the largest number of children expected. On the day of the party, you will be charged only for the number of kids that actually attend. Our party schedule fills up quickly. We suggest you book well in advance to get the date and time you want. Generally, at least 3 weeks in advance is recommended. Enough for your guests to be comfortable as well as a small area in which the Mad Scientist can perform. The Mad Scientist works off of a table, which we ask you to provide (see the next question). The show itself takes place in front of the table. The take-home activity making can either be done on the floor (we bring a floor cover) or at a separate table, whichever you prefer. What does the Mad Scientist bring and what do I need to provide? A table. Card table-size or larger is fine (though larger is better). If the party is to be indoors, a room or area which can be darkened somewhat will enhance some of the experiments. The show, including the take-home activity, lasts about 45-60 minutes and may depend slightly on the number of kids. Each add-on typically adds 10-20 minutes to the show, depending on the activity. How long will the Mad Scientist be there? For a standard party, the Mad Scientist will be onsite for approximately 90 minutes. (Shows with add-ons will run longer.) They will arrive about 15-20 minutes before showtime to set up and spend about the same amout of time after the show ends to clean up. When planning your party, we recommend that showtime be scheduled for sometime AFTER your official party start time to allow guests time to arrive and get settled, and to allow for latecomers. Because our instructors are often scheduled for multiple venues in a day, significantly delaying the start of your show to accomodate late guests may result in a shorter show. Please remember: When booking Mad Science for your party, you are purchasing a performance for a designated showtime, not hiring a Mad Scientist for the duration of your party. As such, prompt payment at the conclusion of the show is appreciated so that our Mad Scientist may proceed to their next destination. Nope! The Mad Scientist cleans up after themselves when they are done! You won't even know they've been there! (Except the kids will be much happier than they were before the show.) The Mad Scientist will have a table cover for the show table and a floor cover for the activity area. The Mad Scientist will pack up all of their materials and carry any trash out with them. 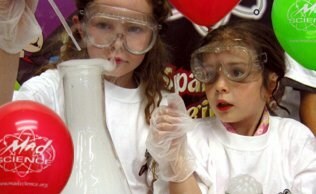 Book your Mad Science Birthday Party online or call or e-mail us!